The Lush Chrome Stool Cream has extraordinary style with a contemporary yet traditional mixture. This versatile nature of the Lush allows it to match any decor and will look right at home within its setting. Choose the Lush and instantly enhance your bar area. Visit our International Delivery Information for full details. Change of heart? You can return the item(s) to us within 14 days. Please visit our Returns Policy for full details. The seat is well padded with a spacious seat pad and a medium height backrest for support to your back presenting a traditional look to the Lush, but the lined grooves of the seat offer a contemporary touch. The cream faux leather and chrome footrest, stem and base interact to produce a beauty of a stool that is pleasant to look at and even more satisfying to sit on. 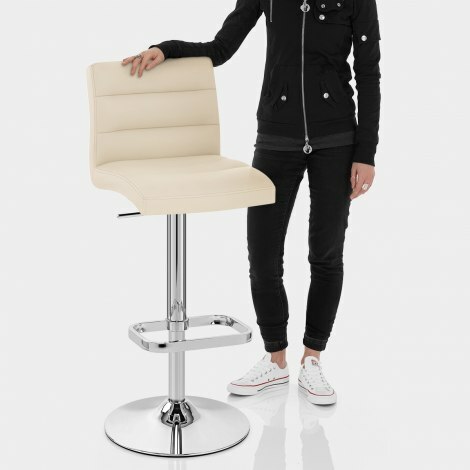 Housed within the Lush is gas lift functionality, 360 degree seat swivel and a rubber floor guard below enabling the Lush to be a truly rewarding stool that will not disappoint. "Excellent service, well manufactured product"
From Our Customers Why not upload your photo's while writing a review ? V. nice product. Comfortable, well made and good quality. Easy to assemble and will look great in my new kitchen. Delivered within a couple of days if ordering. Clear and easy to use website. Would recommend both the suppliers and the product. Prompt delivery. Extremely well packed. Looks good. Very comfortable. More than we wanted to pay, but found it was worth it. Fast efficient service and an excellent product. It was easy to assemble. Your E-mail was successfuly sent.